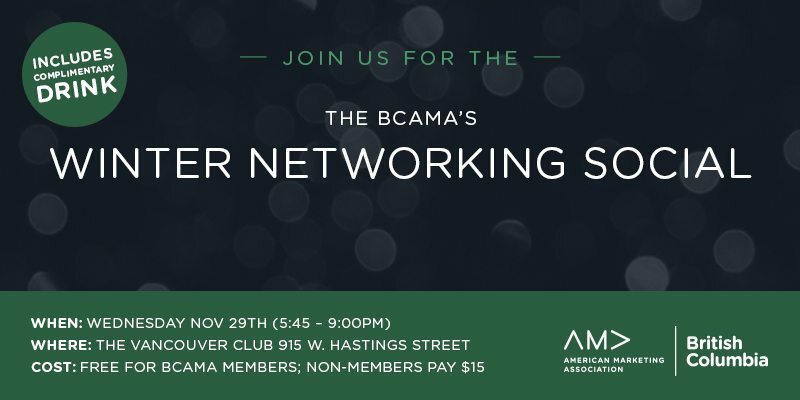 It’s never too early to think about the holidays…or should we say it’s never too early to think about holiday get-togethers–like our annual Winter Networking Social at the Vancouver Club. So join us on Wednesday November 29th for the unofficial launch off the marketing industry’s holiday celebration season. Apart from the complimentary drink that we’ll be offering–and yes, we did say complimentary, as in free–it’s a great opportunity to catch-up & socialize with colleagues AND make new connections, too. Even better, this event is FREE for BCAMA Members. And just $15 for everyone else. But don’t miss out; our last event sold out two weeks ahead of time. So book your tickets and/or register as soon as you can.